Marc Mezvinsky has an easy job. His rich and powerful in-laws, Bill and Hillary Clinton, have a bunch of rich and powerful friends who give Mezvinsky and his friends millions of dollars to invest and (in theory, anyway) make them even more money. Since its founding, Eaglevale has spent 27 of its 34 months in operation below its "high-water mark," a term that describes whether a Day One investor is in the black. Its annualized rate of return from inception is 0.87%, investor documents show. The hedge fund, which oversees about $400 million, reported a 48 percent decline in one of its smaller funds focused on Greece. Mezvinsky acknowledged in a note to investors that Eagelavle's predictions of a quick economic recovery in Greece were "incorrect." This is not to say that giving your money to Eaglevale is a bad investment. Of course, if your primary concern is short-term profit, you should probably look elsewhere. But if you are a wealthy Democratic donor who places a high value on long-term political access to one of America’s most powerful families, Eaglevale is the fund for you. Not surprisingly, the fund’s early group sessions for prospective investors attracted "standing-room-only crowds." Prominent investors include Lloyd Blankfein, chairman and CEO of Goldman Sachs, where Mezvinsky used to work. Blankfein has contributed generously to Democrats over the years, and has hosted fundraisers for Hillary Clinton. Marc Lasry, the billionaire hedge fund manager who co-owns the Milwaukee Bucks, is also an investor. 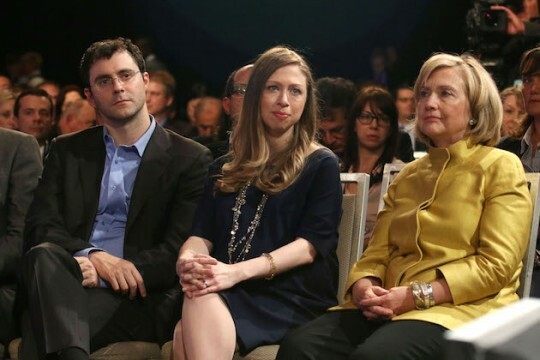 Lasry, who used to employ Chelsea Clinton at his $13.3 billion hedge fund, Avenue Capital Group, is a longtime Democratic donor and figures to be one of Hillary Clinton’s top fundraisers in 2016. Lasry had been President Obama’s choice to serve as U.S. ambassador to France, but was forced to withdraw his name over his ties to an alleged poker ring run by the Russian mob. Wall Street tycoons are clearly ready for Hillary, and there are few better ways to show that than by giving money to her son-in-law to play with. He might not be any good at it, but he does know someone who might live in the White House one day. At that’s where the real money gets made. This entry was posted in Politics and tagged 2016 Election, Chelsea Clinton, Democratic Donors, Marc Lasry, Ready for Hillary, Wall Street. Bookmark the permalink.